Yesterday I briefly shared with you my heartache of having to switch to formula. Over the last 14 weeks we've had our ups and downs with breastfeeding. We've had some rough days and nights that have brought both me and Cruze to tears over my lack of milk. A few times I was fortunate enough to have a few bags of frozen milk in the freezer but after those quickly ran out, we've had to supplement with formula. 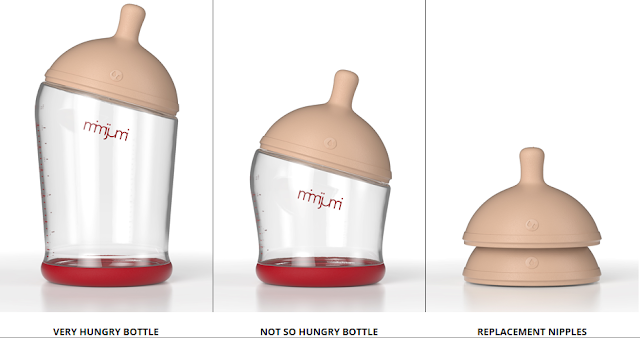 No part of this has been easy but one thing that has made it just a little... less hard has been our Mimijumi bottle. I wanted to do a review on this bottle after it was sent to me while I was still pregnant. Solely based on the appearance and packaging I would give this bottle 5 starts. But now? Now I can rate it from experience. My baby doesn't want anything but the real thing. normally. This bottle changes that. It's like he doesn't even notice a difference! Offended? Slightly. JK! It actually takes a teensy bit of the load off since I know he is content and eating like a champ. So here is a brief review. Style: Look at that picture! It's the cutest bottle ever, don't you agree??!! Price: Well mine was sent to me for free but from what I found online it's not the cheapest but priced fairly. I think I would pay ten times the price if I knew it would help my baby. I think it's obvious that I am very happy with this bottle. Happy baby = happy mommy. Daddy is pretty happy about it too! Thanks Mimijumi for making a bottle that is close to the real thing! Momma's everywhere can rejoice over the design and natural feel of these bottles! ooh!! I am only 10 weeks pregnant and I plan on breastfeeding, possibly with pumping, but I want bottles as backups, I think I love these! I have to go check them out! clear idеa about from this post. blog. Ηe usеd to be entігеly right. This submіt actually madе my day. Үou cann't consider simply how a lot time I had spent for this info! Thank you! which they're getting incredibly easy to practice. for you ѕupport glucose metabolic rate. I'll bookmark your blog and test once more right here frequently. I am reasonably certain I will be told lots of new stuff right here! Best of luck for the next! You've made some decent points there. I looked on the net for more information about the issue and found most individuals will go along with your views on this web site. be totally right. This publish actually made my day. You cann't consider simply how much time I had spent for this info! Thank you!